Carol Moore says: Reminds me of my girls...lol Get a belly ache after all that candy. :D Wonderful depiction! ~ Reply? 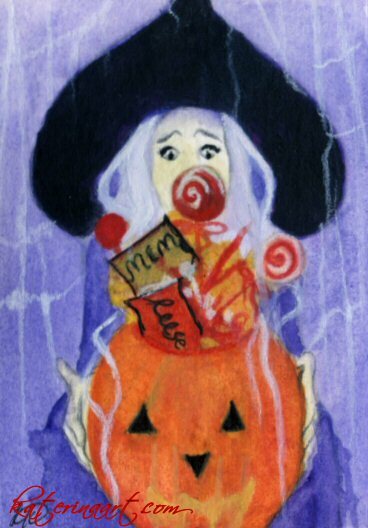 katerina Koukiotis says: LOL.. thanks carol i was laughing the entire time i was painting this one, she kinds looks overwhelmed by all the candy :)	~ Reply? Jenny Heidewald says: That is ADORABLE!!! Her expression is priceless! :D	~ Reply? katerina Koukiotis says: thank YOU jenny so much xoxox	~ Reply? Selina Fenech says: Perfect expression! ~ Reply? katerina Koukiotis says: thank YOU selina xoxo	~ Reply?